The business world has suffered from manic-depressive illness for at least a quarter of a century. Economic contractions follow speculative manias, but as soon as we are in an economic contraction, corporations and markets try to identify the next investment wave, - the next mania that will drive up stock prices, profit and compensation. The 2007-2009 global crisis, followed by today's deep instability in the markets and within corporations, has exposed the contradiction between the ethical stance of the corporate world and the considerable damage caused by excessive risk-taking in the race for profit. This crisis was by no means unique in financial history. New profit opportunities always fuel bubbles and crises, because profit-making takes precedence over risk management. This book is an exploration of the corporate failures of several crises. It attempts to propose reforms to rebalance power within corporations - giving more weight to risk and compliance functions - and also to better regulate corporations, such as rating agencies and audit firms, that contribute to the formation of public trust in financial markets. 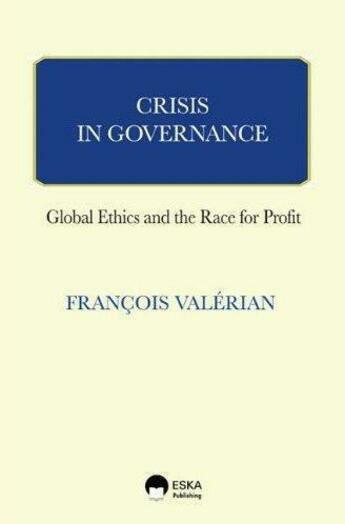 Better corporate governance can only be ensured by better regulatory governance at the global level. Taking stock of the achievements but also the limitations of the G20 governance model, the author proposes an international convention on corporate governance, using the leverage of coordinated stock exchange regulation to improve corporate governance and try to prevent future crises.